For a map of Fort Collins, click here. The Tres Colonias and the Holy Family neighborhoods are on the North side of Fort Collins. 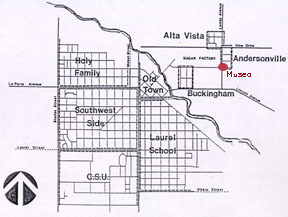 The Museo del las Tres Colonias is in Andersonville, on the east side of Fort Collins, as the site of what was once a sugar beet factory. The "three colonies" are Alta Vista, Buckingham and Andersonville, but they aren't the only historic Latino neighborhood in Fort Collins: the area north of the Holy Family Church is also a long-time residence of Hispanics. Las Tres Colonias was originally settled by Germans and Russian immigrants; the Holy Family Neighborhood was first settled by African-Americans. The residents of both neighborhoods are presently predominantly of Mexican-American descent. For an extensive overview of these neighborhoods and their history and architectural development, go to the Fort Collins History Connection. Also, the materials collected in the History section of this website provide an extensive look at the economic and social justice aspects. Of particular interest in the History section is the survey "Hang Your Wagon to a Star," which provides an extensive historical overview of the creation and settlement of these neighborhoods.